When I lived in NYC during college, I remember being struck by how glamorous the East Coast natives made winter look. The city girl’s winter dress code seemed to be a fur vest + leather moto jacket + OTK leather boots. I would scurry past them on the street, shivering in a full-length down coat while trying not to get hit by their massive Longchamp or Louis Vuitton totes. Now when I look back at that time, I’m struck by a very different thought. What are the environmental repercussions of a city filled with girls in head-to-toe animal skins? According to the International Fur Trade Federation, 85% of fur comes from fur factory farms (as opposed to animals hunted in their natural environment). Fur factories are designed to maximize profits at any legal expense, resulting in land devastation, pollution and water contamination – not to mention animal treatment that is down-right sadistic. The U.S. Department of Agriculture has reported that U.S. mink farms produce 1 million pounds of feces annually, which is released into our groundwater through rivers and streams. The air and atmosphere too is getting polluted when toxic chemicals such as ammonia, formaldehyde, and other bleaching agents are often used to kill and clean the animals. So should the eco-conscious be shopping for faux fur instead? The answer may not be that simple. Although it’s been popularized in recent years by supermodel-studded PETA campaigns, most faux fur is made from non-renewable, petroleum-based products, such as nylon, acrylic and polyester (also known as plastic). Yep, the same thing your trash bags are made of. The list of reasons of plastic’s detrimental effects on the environment goes on and on: it’s not biodegradable, creates rampant waste in our oceans and forests, expels toxic chemicals into the air and groundwater, is harmful to wildlife and sustains the oil industry. So choosing faux fur instead of real fur is kind of like eating a cheese pizza instead of a burger. Sure, you are saving an animal but it’s still not the healthiest lunch out there. What’s my solution? Second-hand faux fur. Buying items that are used is the most environmentally responsible way to shop for clothing; the item already existed so no additional petroleum or furry friends were needed to create it. This vest is 100% acrylic shaggy knit and I found it at an L.A. thrift store years ago. There’s no brand name on it but the tag looks like it came from the 70’s. The cut was originally a bit wide for me so I had it altered to fit and now it’s the perfect layering piece during the chillier months. What an informative blog! This is such a hot topic and I love that you are talking about it. And of course, beautiful, as always. ? I totally agree with you Kasha! We went to Crossroads and Wasteland yesterday and I think half the enjoyment we got from shopping was because we knew everything was second hand and it hadn’t made it’s way to a landfill. 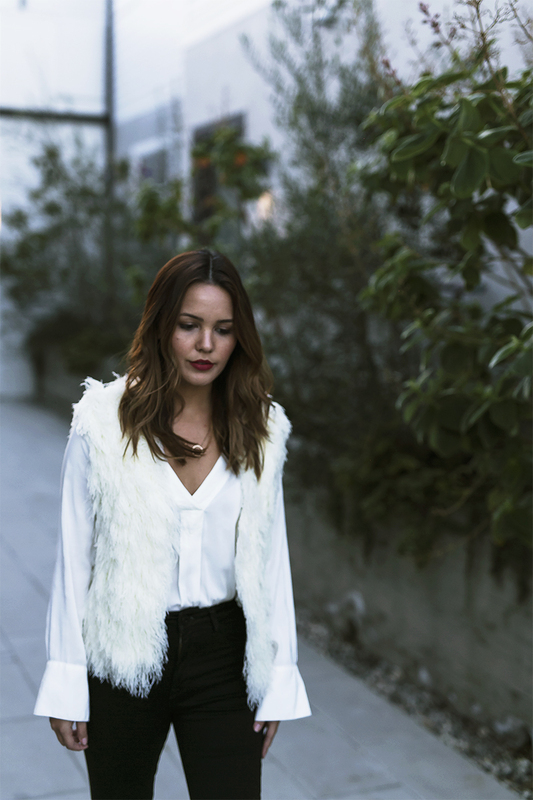 I love that vest and being in LA that extra layer is all you need to make sure your cosy during these colder months.